Every now and then, Scandal slows down long enough to let us catch our breath. After the multiepisode hostage arc and last week's emotionally draining Ferguson, Mo.-inspired episode, this week's installment simply laid down bricks for plotlines that are likely going to carry us through the rest of the season. Rose, played by Marla Gibbs of The Jeffersons fame, returns looking for Olivia's across-the-hall neighbor Lois. You and I know that she was killed during Olivia's kidnapping fiasco, but Rose can't figure out why it's been three weeks since she heard from Lois, who is—surprise—the love of Rose's life! Quinn finds Lois' body so that Rose can say her goodbyes. As Rose laments about how "things will never be the same," Olivia begins to accept that her life, post-kidnapping, will also never be the same … but she still has to move forward. 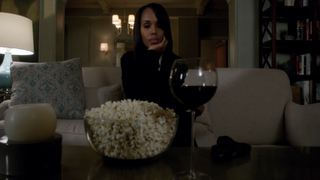 Olivia goes home, gets rid of her red-wine-stained couch cushion and pours herself a tall glass of red wine and a huge bowl of popcorn. Olivia is slowly coming back to herself. Sen. Susan Ross is sworn in as vice president. The easily overlooked subplot in last week's episode revolved around Fitz and Mellie's decision to replace VP Andrew Nichols—who's been rendered silent by a Huck-induced stroke—with Ross, who suffers from a case of perpetual foot-in-mouth, because they want someone in the veep spot who won't pose a formidable challenge to Mellie's forthcoming presidential bid. Low-down, dirty Leo Bergen—former campaign strategist for Fitz's former VP Sally Langston—makes a return when his girlfriend, Abby, hires him to whip Susan into shape after she botches her first press appearance as the vice presidential nominee. But Leo almost breaks her by yelling lines like, "Stop telling the truth!" so Abby has to fire him. Abby and Leo are surprisingly cute together, though! Abby also convinces Olivia to convince Fitz to convince the Senate to support Ross' nomination by explaining that by going to war with West Angola after saying the U.S. wasn't going to war with West Angola and then pulling out of the war in West Angola, Fitz made a mockery of democracy. Fitz gets all up in Olivia's face and in her space, per usual, saying, "You know why I did it." He never pulls that stunt like that in front of other people, but this time he was in front of Cyrus and Abby. Awwwkward. By the end of the episode, Susan is sworn in. Mellie rejoices, but we know that Mellie's life has been a series of partial wins. I think Susan is really going to shine as VP, which is going to cause the return of Mad Mellie. Yesss! Those B613 files are back again. Remember the B613 files that Jake gave to David that Charlie stole for Rowan and gave to Huck, who gave them to his estranged wife, Kim, to prove that he was telling the truth about the supersecret spy organization that stole him from Kim and Javi? (Exhale.) Well, Kim brought them to David Rosen, saying that she got them from her husband, Diego Muñoz, and David freaks out like he's seen the Ghost of His Future. When David tells Huck and Jake what happened, Huck outs himself as Diego Muñoz. David and Jake are like, "You better get your woman in check," and Huck is like, "I'll handle it." But, see, now that Kim finally believes Huck's story about why he was separated from her and Javi, Kim invites Huck to have dinner with them, and when she insists that he testify about what's in those files, Huck has to choose between his allegiance to Olivia and his allegiance to his new-old family. When Huck sits down to testify, at first he says he can't remember the answers to any of David's questions, which disappoints Kim. But when Huck thinks about what it's going to be like to be wrapped up in Kim's good graces, he starts spilling the painful details of his time in the hole. At first David is upset, but then he tells Jake that he's going to do what he can to protect Olivia and friends, but he's going to get the bad guys. But how are you going to do that, David? Olivia and her friends are the bad guys! Kim rewards Huck with a kiss. Yay! I claimed this for Huck's 2015. Huck, you might as well enjoy your last days with your family, because you're going down, buddy. This is gonna be fun!